Homeowners in Perth have a variety of alternatives when it comes to purchasing automated pool cleaners (APCs). These time-saving pool cleaning devices are easy to use, affordable and efficient. Poolmart WA provides pool cleaners to Perth residents at cost-effective prices. Contact us today for more information. Most automatic pool cleaners are inexpensive, no matter what size or model you choose. This makes matching the cleaner to meet the needs of your pool a painless task. There are also models available that can be used to chemically treat the pool. Automatic pool cleaners work well in supplying pool owners with cleaner, more hygienic swimming conditions. They are able to sanitize your pool and are also energy efficient. They navigate the pool well and are self-programmable, saving time and energy on extra cleaning. 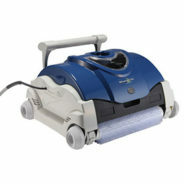 Regardless of which type of automatic pool cleaner you purchase at Poolmart WA, you’re guaranteed an excellent product. Robotic pool cleaners are self-contained cleaning machines that move themselves around the pool sucking up dirt and debris. 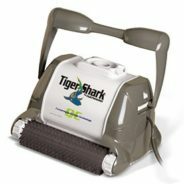 Many top models (such as the Hayward Tiger Shark sold in our stores) also use rotating brushes and rollers to scrub a pool’s underwater surfaces. Most robotic pool cleaning machines operate using a water-safe electrical cord, but there are some that operate with a rechargeable battery. Pressure-side pool cleaners use water pressure to pick up dirt and debris. These types of pool cleaners connect to a swimming pools return line and use the pressure to create a circulation effect to flush dirt upwards into the cleaner. 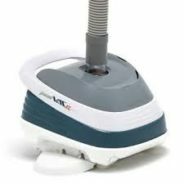 Suction-side cleaners are a popular low cost alternative to robotic and pressure-side pool cleaners. These types of automated swimming pool cleaners use a pool’s weir or a dedicated suction line to create the suction power needed to clean and navigate around your pool. If you’re looking for the perfect pool cleaner, our team of cleaning specialists will advise you on the type of automated pool cleaner that will best suit your swimming pool. We’ll also arrange a free demo. Contact us today for more information on our product range. Contact us today for more information on our product range.